To prevent such a scenario, the DataCapable platform cannot be used for surveillance, spying, or any use case that violates governing laws. DataCapable complies with their social media partners, data terms including approvals for new use cases and approval for each client leveraging a use case, In some cases, their clients are only approved for event detection (location and event type). This means that no data related to a single person is shared and/or monitored. Raymond says the event detection module is looking for specific event types (outages, gas leaks, active shooter) to determine if there is an event happening at a school system that could put teachers and students in harms way. Last spring there was a gang fight organized on Facebook and Twitter where the kids were going to gather at a high school in southeast Detroit. 77 kids got arrested because Officer Gardner was aware of what the kids were talking about. She alerted Detroit Public School police officers and Detroit police officers who prevented a lot of violence and arrested 77 kids. Where geospatial really comes in, Raymond said, is when an emergency does occur at a school, most school systems do not have their building floor plans and school classroom information in a GIS format that makes it available to first responders. After the Parkland and Texas shootings, the governor of Michigan announced that the school safety commission was to form, and he allocated $20 million to the budget for the Michigan State Police who are responsible for handing out the school safety grants. In setting up the parameters, they have requested single entry security doors. At the 2018 Esri User Conference, numerous industries came to together to envision the future of school safety. This included discussions on the role of ArcGIS, weather, event detection, school mapping, and other geospatial tools that align with the goal to promote safety across the U.S. school systems. Law enforcement was very much on board with the School Safety GIS Initiative at the Esri Conference. They were very pleased at the idea of having access to the floor plan and data layers that are needed. “They are interested in how the empowerment of gang intelligence and student resource officers can help them in their schools and communities,” said Raymond. DataCapable is an Esri Business Partner that provides solutions and delivers services that align operational data with customer engagement opportunities. DataCapable has put a lot of analytics together and they have a good system for listening for active shooters across country. They are also listening for information on the wildfires in California alert the fire departments of where new flareups. There are other geospatial software companies that have developed this type of system that can support this initiative, and can get involved. “We talk of giving teachers guns, but they are a defense mechanism, they are not a preventative mechanism,” Raymond pointed out. 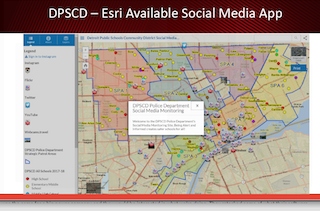 Vendors supporting the initiative need to embrace interoperability of data and be able to provide reports of dangerous situations right into the police or school ArcGIS Online organization account. Congratulations to Kerry-Ann Harriott of Jamaica for winning the GISCafe Sweepstakes at the Esri User Conference 2018. Her prize was a $100 Amazon Gift Certificate. Kerry-Ann Harriott is a graduate of the University of Technology, Jamaica with a BSc.in Surveying & Geographic Information Science (Hons). She also holds certifications in Land Surveying as well as focused GIS content. She has amassed several years of experience in the field of GIS; experience which involves GIS implementation, application, training and technical support. This experience as well as knowledge of GIS has spanned across both Private Sector and Public Sector. Kerry-Ann now holds the post of GIS Mapping Officer at the Forestry Department of Jamaica. This entry was posted on Thursday, August 9th, 2018 at 11:58 am. You can follow any responses to this entry through the RSS 2.0 feed. You can leave a response, or trackback from your own site.